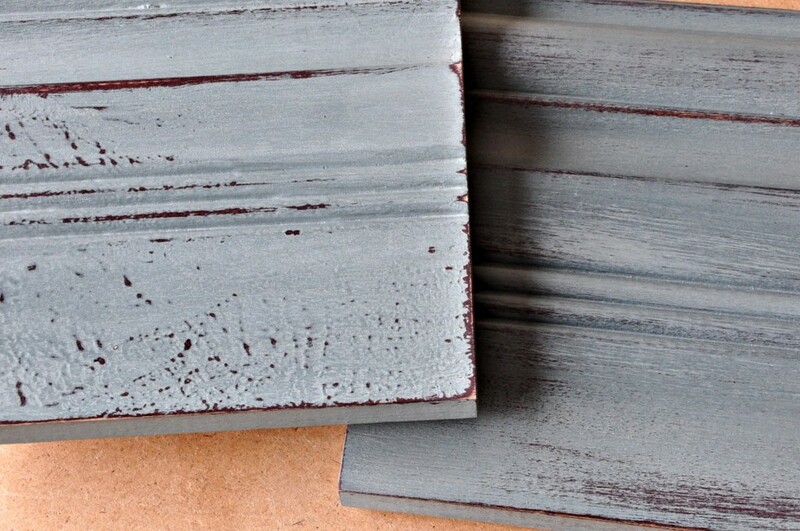 Creating a textured surface or a smooth surface is easy with a chalk type paint. 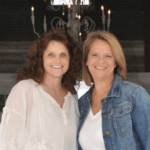 Follow along as we take you step-by-step though the process of creating each of these time worn looks. 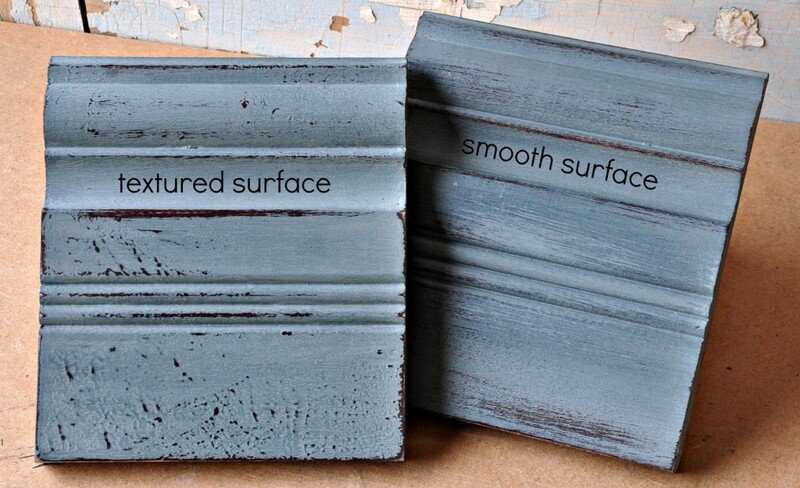 The sample boards above have been created using simple techniques to create a distressed textured look or a distressed smooth finish. Below are the items that were used for this tutorial. Two complimenting colors of paints. Brown and dusty aqua were used for this tutorial. Two sample boards, or a practice piece of furniture. A cup of water, a rag or small cloth. A fine grit piece of sandpaper. 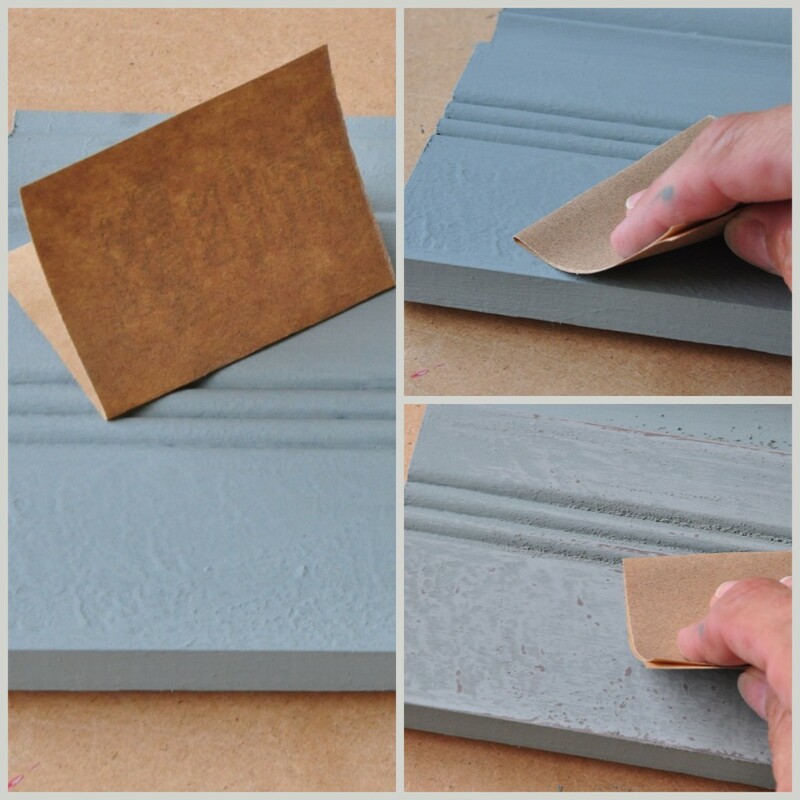 We are using 220 grit sandpaper for this tutorial. Mark the backs of your boards with a #1 and #2. We will be referring to each board by their numbers through the remainder of the tutorial. On the first board we will be creating a distressed textured look. The key to this look is to apply a heavy textured (or messy) base coat. This can be achieved by pouncing the paint brush to create texture or simply brushing the paint on using deliberate heavy (messy) strokes. The second board will have the distressed smooth finish on it. On this board apply a smooth base coat by loading your brush first with the base color then dipping it in water. After that, lay the paint on the board (brushing with the grain) evenly. Set the boards aside to dry completely. Notice the difference between the two boards? 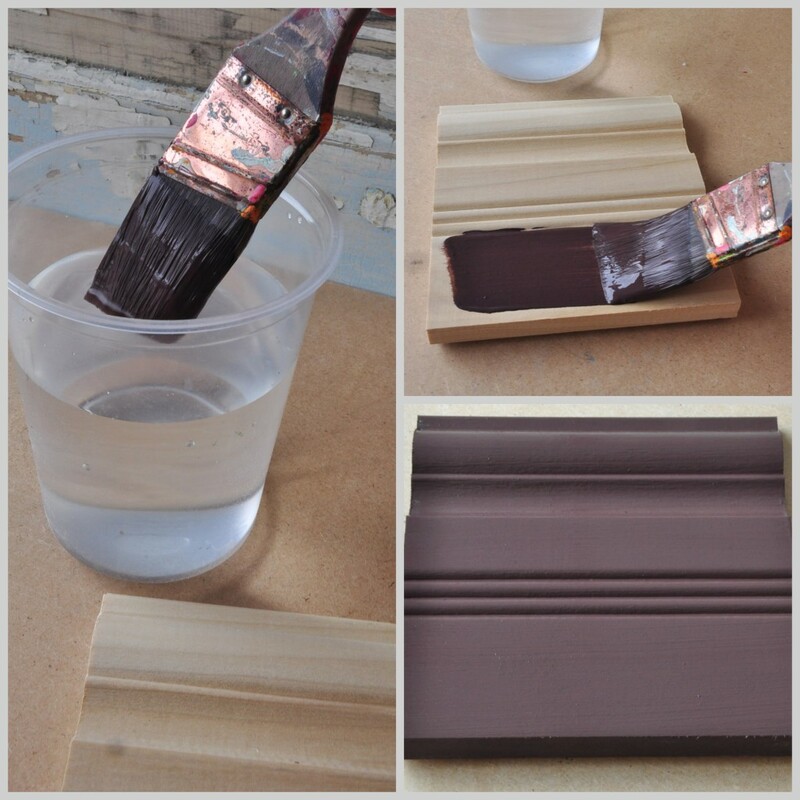 After the base coat has dried, apply a thin top coat over the base coat on each board and set them aside to dry. 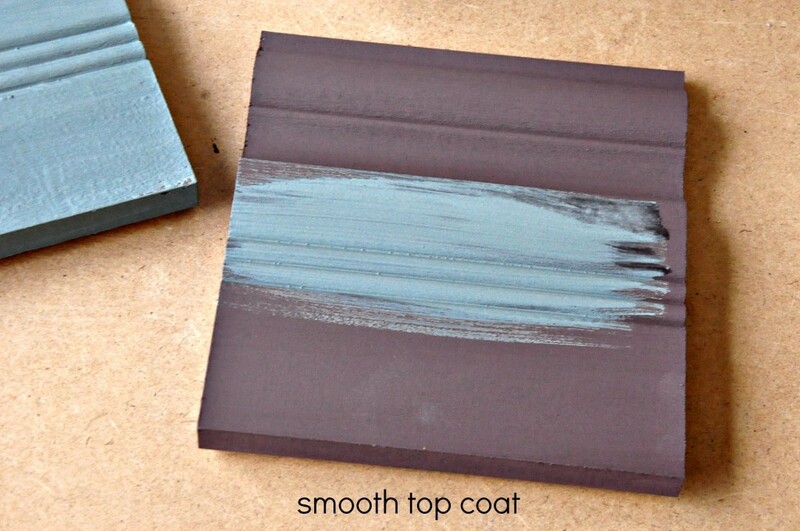 This coat can be applied the same on both the textured board and the smooth board. Be sure NOT to apply the paint too thick. A thin top coat will be easier to distress through than a thick top coat. After the top coat on each board is dry, it’s time to distress. On board #1 (our textured finish) use a fine grit sandpaper to lightly sand through your top coat revealing the textured strokes from your base coat. The above example shows the artist holding the paper flat and sanding in a circular motion to reveal the textured base coat through the top coat. To distress the ‘smooth finish’ board, use the wet distress technique. Take your rag or cloth and soak it with water. 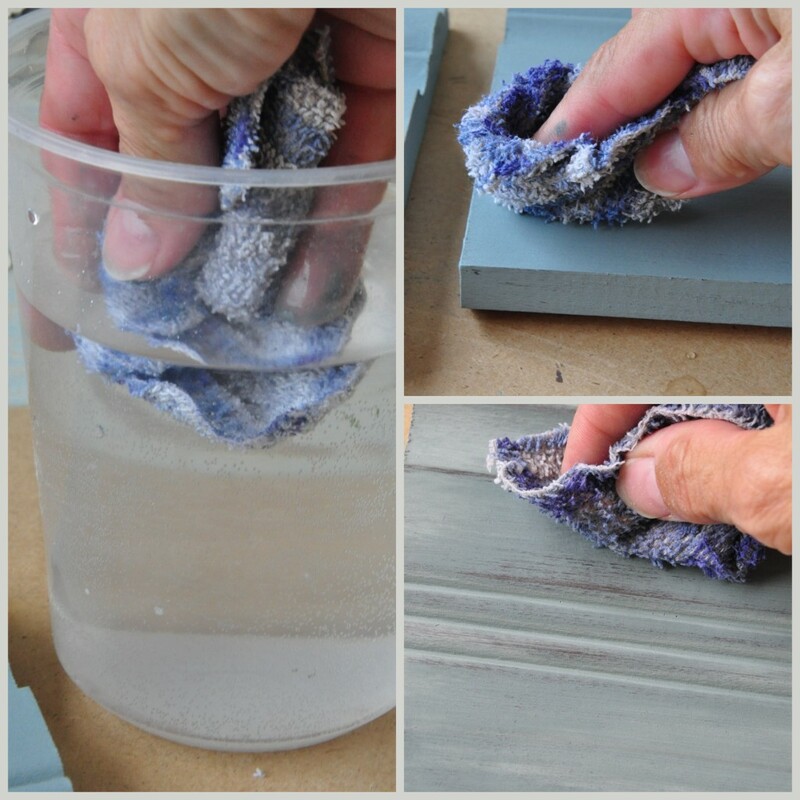 After wringing it out completely, use the damp rag to distress through the top coat to reveal the base coat color while smoothing the dry paint slightly. 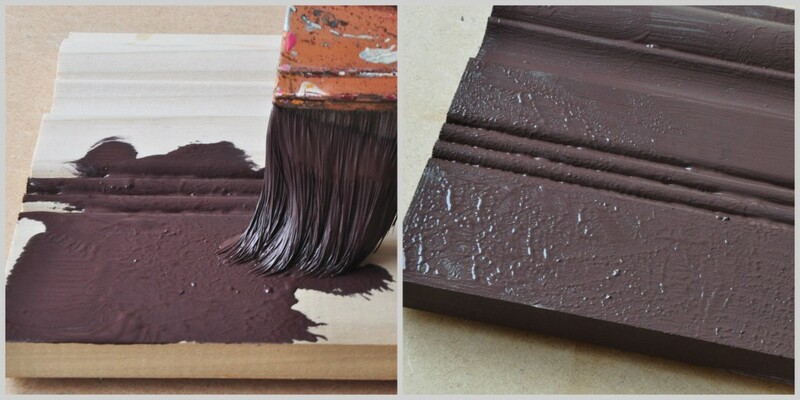 Because the base coat was applied in a smooth manner this will reveal the base color while blending the two colors slightly to create a smooth time worn distressed look. After the boards have been distressed to your liking, apply a finish coat of wax to ‘set’ the paint and complete the look. 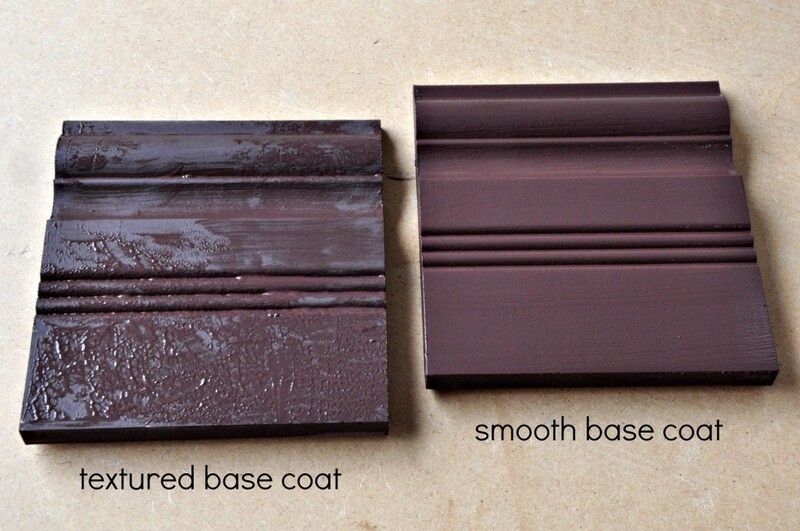 When applying these techniques to an entire piece of furniture, be strategic about where you add texture and where you distress. Texture can be applied to the entire piece or simply add it in a few areas of the piece to add interest. If you’ve feel you’ve over done it or aren’t satisfied with the look, don’t fret, paint over it and try again.